A land-grant university (also called land-grant college or land-grant institution) is an institution of higher education in the United States designated by a state to receive the benefits of the Morrill Acts of 1862 and 1890. The Morrill Acts funded educational institutions by granting federally controlled land to the states for them to sell, to raise funds, to establish and endow "land-grant" colleges. The mission of these institutions as set forth in the 1862 Act is to focus on the teaching of practical agriculture, science, military science, and engineering (though "without excluding... classical studies"), as a response to the industrial revolution and changing social class. This mission was in contrast to the historic practice of higher education to focus on a liberal arts curriculum. A 1994 expansion gave land grant status to several tribal colleges and universities. Ultimately, most land-grant colleges became large public universities that today offer a full spectrum of educational opportunities. However, some land-grant colleges are private schools, including Cornell University, the Massachusetts Institute of Technology, and Tuskegee University. The concept of publicly funded agricultural and technical educational institutions first rose to national attention through the efforts of Jonathan Baldwin Turner in the late 1840s. The first land-grant bill was introduced in Congress by Representative Justin Smith Morrill of Vermont in 1857. The bill passed in 1859, but was vetoed by President James Buchanan. Morrill resubmitted his bill in 1861, and it was ultimately enacted into law in 1862. Upon passage of the federal land-grant law in 1862, Iowa was the first state legislature to accept the provisions of the Morrill Act, on September 11, 1862. Iowa subsequently designated the State Agricultural College (now Iowa State University) as the land grant college on March 29, 1864. The first land-grant institution actually created under the Act was Kansas State University, which was established on February 16, 1863, and opened on September 2, 1863. The oldest school that currently holds land-grant status is Rutgers University, founded in 1766 and designated the land-grant college of New Jersey in 1864. The oldest school to ever hold land-grant status was Yale University (founded in 1701), which was named Connecticut's land-grant recipient in 1863. This designation was later stripped by the Connecticut legislature in 1893 under populist pressure and transferred to what would become the University of Connecticut. A second Morrill Act was passed in 1890, aimed at the former Confederate states. This act required each state to show that race was not an admissions criterion, or else to designate a separate land-grant institution for persons of color. Among the seventy colleges and universities which eventually evolved from the Morrill Acts are several of today's historically black colleges and universities. Though the 1890 Act granted cash instead of land, it granted colleges under that act the same legal standing as the 1862 Act colleges; hence the term "land-grant college" properly applies to both groups. In imitation of the land-grant colleges' focus on agricultural and mechanical research, Congress later established programs of sea grant colleges (aquatic research, in 1966), space grant colleges (space research, in 1988), and sun grant colleges (sustainable energy research, in 2003). West Virginia State University, a historically black university, is the only current land-grant university to have lost land-grant status (when desegregation cost it its state funding in 1957) and then subsequently regained it, which happened in 2001. The land-grant college system has been seen as a major contributor in the faster growth rate of the US economy that led to its overtaking the United Kingdom as economic superpower, according to research by faculty from the State University of New York. The three-part mission of the land-grant university continues to evolve in the twenty-first century. What originally was described as teaching, research, and service was renamed learning, discovery, and engagement by the Kellogg Commission on the Future of State and Land-Grant Universities, and again recast as talent, innovation, and place by the Association of Public and Land-Grant Universities (APLU). Prior to enactment of the Morrill Act in 1862, Michigan State University was chartered under Michigan state law as a state agricultural land-grant institution on February 12, 1855, as the Agricultural College of the State of Michigan, receiving an appropriation of 14,000 acres (57 km2) of state-owned land. The Farmers' High School of Pennsylvania, later to become The Pennsylvania State University, followed as a state agricultural land-grant school on February 22 of that year. Michigan State and Penn State were subsequently designated as the federal land-grant colleges for their states in 1863. Older state universities – such as the University of Georgia, which was established with a grant of land in 1784 – were also funded through the use of state land grants. Indeed, land grants to educational institutions are a practice inherited from Europe, and are traceable all the way back to the societies of classical antiquity. These earlier examples, however, offered a different "mission" than the practical education offered by land-grant institutions established under the Morrill Act (or the Michigan legislature). The mission of the land-grant universities was expanded by the Hatch Act of 1887, which provided federal funds to states to establish a series of agricultural experiment stations under the direction of each state's land-grant college, as well as pass along new information, especially in the areas of soil minerals and plant growth. The outreach mission was further expanded by the Smith–Lever Act of 1914 to include cooperative extension—the sending of agents into rural areas to help bring the results of agricultural research to the end users. Beyond the original land grants, each land-grant college receives annual Federal appropriations for research and extension work on the condition that those funds are matched by state funds. While today's land-grant universities were initially known as land-grant colleges, only a few of the more than 70 institutions that developed from the Morrill Acts retain "College" in their official names; most are universities. The University of the District of Columbia received land-grant status in 1967 and a $7.24 million endowment (USD) in lieu of a land grant. In a 1972 Special Education Amendment, American Samoa, Guam, Micronesia, Northern Marianas, and the Virgin Islands each received $3 million. In 1994, 29 tribal colleges and universities became land-grant institutions under the Improving America's Schools Act of 1994. 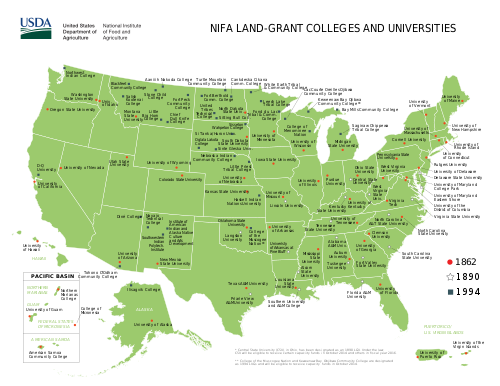 As of 2008, 32 tribal colleges and universities have land-grant status. Most of these colleges grant two-year degrees. Six are four-year institutions, and two offer a master's degree. Land-grant universities are not to be confused with sea grant colleges (a program instituted in 1966), space grant colleges (instituted in 1988), or sun grant colleges (instituted in 2003). In some states, the land-grant missions for agricultural research and extension have been relegated to a statewide agency of the university system rather than the original land-grant campus; an example is the Texas A&M University System, whose agricultural missions, including the agricultural college at the system's main campus, are now under the umbrella of Texas A&M AgriLife. ^ a b "Sesquicentennial Message from President". Iowa State University. Retrieved 8 July 2011. ^ "Iowa State: 150 Points of Pride". Iowa State University. Archived from the original on 21 June 2015. Retrieved 8 July 2011. ^ Isaac Ehrlich, Adam Cook, and Yong Yin. What Accounts for the US Ascendancy to Economic Superpower by the Early Twentieth Century? The Morrill Act–Human Capital Hypothesis. Journal of Human Capital 12, no. 2 (Summer 2018): 233-281. ^ Gavazzi, S. M.; Gee, E. G. (2018). Land-grant universities for the future: Higher education for the public good. Johns Hopkins University Press. ^ UGA Graduate School: About the University of Georgia. Gradschool.uga.edu. Retrieved on 2013-07-15.